The Spanish motorbike driver, Alfonso Nieto, better known as Fonsi, is starting a new career this year in the Le Mans Series races. The ex-champion of Spain in 125cc and winner of many 250cc World Championship races (he was even vice-champion in 2002) is now taking on four wheeled machines! 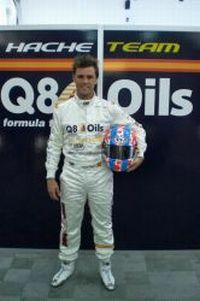 Indeed, he will take the start of the 1000 km of Algarve in two weeks time behind the wheel of an LMP2 entered by Iberian team Q8 Oils Hache. The crew members will be 100% Spanish … and one third feminine! Gentlemen, you have been warned! Deuxième derrière Peugeot, une victoire pour Pescarolo Sport !